Basra - thanoscardgamess jimdo page! Basra is a Middle Eastern fishing game. A standard 52 card pack is used. There are four players, partners sit opposite each other. Each turn consists of playing one card face up to the floor and possibly capturing some of the cards that are there. Captured cards are placed face down in front of the player who captured them. If you play a card which does make a capture, you must make the capture. 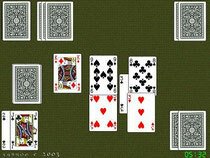 A basra occurs when a player captures all the cards from the floor, leaving it empty. If you play a jack when there are cards on the floor, it captures all the cards from the floor, leaving it empty, but this does not count as a basra. The seven of diamonds behaves in a similar way to a jack - it captures everything on the floor. If the cards on the floor are all numerals, and their values add up to 10 or less, this counts as a basra.